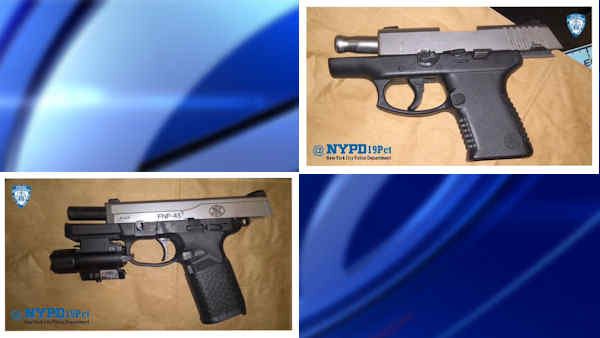 UPPER EAST SIDE, Manhattan (WABC) -- Police arrested a motorist after he allegedly threatened another driver with a gun during a road rage incident on the Ed Koch Queensboro Bridge Wednesday morning. Authorities say 24-year-old Kevin Yudianto, of DeRidder, Louisiana, was involved in a minor collision on the bridge at 9:45 a.m. He allegedly pulled a gun at the other driver and ordered him to pull over. Yudianto then took off as the other driver called 911, according to officials, and police pulled Yudianto over on First Avenue at East 81st Street. According to the criminal complaint, Yudianto told investigators that "he did, in fact, display a handgun to the occupants of the white van; that defendant's vehicle contains 2 handguns - a FN-P .45 caliber and a Taurus .40 caliber; that the handguns are loaded; that the handguns are located inside a black plastic bag on the passenger floor; that the plastic bag contains additional ammunition and a holster; and that a green duffel bag on the 3rd row of seats contains a machete...Each was loaded and each had a round in the chamber." He is charged with two counts of second-degree criminal possession of a weapon.